This is June’s edition of Comet Over Hollywood’s film references in music videos. 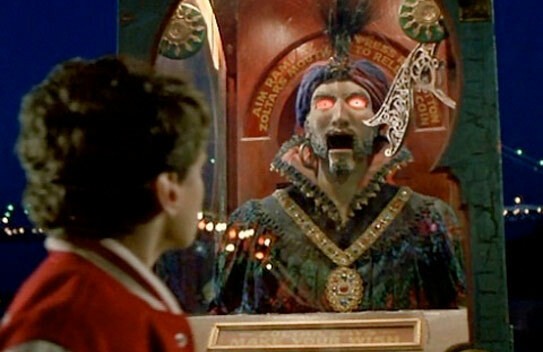 In the film “Big,” a 12-year-old boy makes a wish on a Zoltar fortune teller machine at the fair to be grown up. The next day, he is a 30-year-old man in the form of Tom Hanks. Twelve-year-old Josh wishes to be older in “Big” (1988). Neon Trees lead singer Tyler Glenn channels the 1988 movie in his 2010 music video “1983.” However, Glenn does the opposite. In the music video, Glenn goes to the fairground as an adult in a suit and makes a wish on a Zodiac fortune teller machine. He is transported to younger days, dressed in 1980s punk clothing and hanging out with his friends at the fair. “Big” may not fit into the definition of a classic film, but it is great movie and notable that it is well enough remembered to be in a contemporary music video. Check back next month for July’s classic film in music videos. This entry was posted in Music Video Film References and tagged 1983, Big, Neon Trees, Tom Hanks, Tyler Glenn by Jnpickens. Bookmark the permalink. I had not seen this video, but highly enjoy the homage to what truly is one of the greatest “coming of age” films in history. I know that so people find it hard to call a film like “Big”, a classic film, but there is no doubt in my mind that eventually it will be there.